The SIG Sauer P226 is one of the company's most popular pistols. In this country it has been widely adopted by local, state and federal police agencies, the U.S. Coast Guard, U.S. Navy SEAL teams and has proven just as popular with law enforcement and military organizations around the world. SIG Sauer is now offering two new, limited-edition P226 pistols designed for use in USPSA's Production division. But, as you will see, while designed for action pistol competition, they are eminently adaptable to a number of other uses. The new pistols are offered in a two-tone stainless steel-frame model and a Nitron-finished all-black version built on an anodized aluminum alloy frame, which is the one I chose to test. The two-tone model weighs 8.2 ounces more than its alloy-frame brother, but other than that the pistols are dimensionally and mechanically identical. Functioning and operation are the same as a standard P226. The barrel and slide are locked together by the chamber hood moving up into and bearing on the front edge of the ejection port. When the pistol is fired, the slide and barrel reciprocate to the rear for a short distance before a cam on the bottom of the barrel pulls it down, unlocking it from the slide, which continues to the rear--cocking the hammer and extracting and ejecting the spent cartridge case. A recoil spring located under the barrel then pulls the slide forward and chambers the next round, stripping the next round from the magazine and chambering it as the slide goes into battery. The stainless steel slide has a faultless finish, and dual grasping grooves on the front and rear ensure you can rack the slide with a variety of grips, even when wearing gloves or with sweaty hands. The black Nitron finish is not only extremely durable and practical but cuts down on glare when sighting. The sights consist of a Dawson fiber-optic front and a Warren Tactical rear sight--the hot setup with action pistol shooters these days but, in my opinion, one of the best setups for almost all types of shooting--including home-defense applications. The hard-chromed alloy frame has full-length rails to provide complete support for the slide during its entire cycle which, along with a full-length recoil spring guide rod, help ensure consistent lockup for improved accuracy. 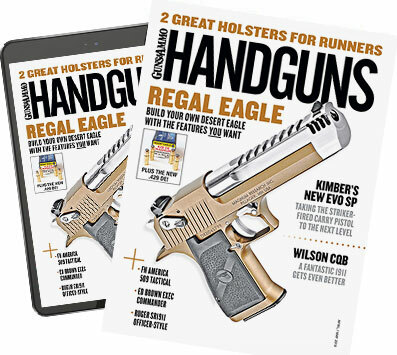 The pistol gets a distinctive look courtesy of nickel-plated takedown, hammer-drop and slide-release levers, trigger, hammer and magazine release. The frame sports a rail for mounting lights, lasers or other tactical accessories. The pistol has an extended grip tang, checkered frontstrap and aggressively textured grip panels. While designed with action pistol shooting in mind, these features provide a secure purchase, significantly improve recoil control and allow fast, accurate follow-up shots. To my way of thinking, they are equally important on a pistol used for police/military service, personal or home defense. While the USPSA series features a traditional DA/SA trigger, SIG Sauer has fitted these pistols with its Short Reset Trigger, which provides a much shorter reset distance than that of standard P226s. In addition, the shooter can feel and hear the reset, which I believe is very useful when making precise, accurate shots with a semiauto pistol. Depressing a lever in front of the left grip panel decocks the external hammer and safely lowers it so that the pistol can be carried with the hammer down on a loaded chamber. A trio of 15-round steel magazines with rubber padded floorplates come with each USPSA pistol. I tested fired the pistol for accuracy from an MTM Predator rest at 25 yards, the results of which can be seen in the accompanying chart. The gun produced some very nicely centered groups ranging from an extraordinary 11â„8 to 23â„4 inches in size and--as with many of the 9mm pistols I have tested--showed a definite preference for slower-moving projectiles. After chronographing the six types of test ammo, I belted on a Blade Tech DOH holster and proceeded to run the pistol through a series of offhand drills at seven and 15 yards. While the double-action trigger was on the heavy side and caused me to throw the occasional flyer, the SRT performed as advertised, and I kept all but four of my shots inside the X and 9 rings of the target. I was especially impressed with the sights. The Warren Tactical rear and Dawson fiber-optic front provided a sharp sight picture that allowed fast target acquisition and transitioning. All of the controls were well-positioned and proved easy to manipulate, and the wide-mouthed magazine well made reloads easy. Magazines dropped free of the pistol--loaded or empty, slide forward or locked open. No complaints there. In my opinion, whether you are in the market for a pistol to use in action pistol competition, police service, personal or home defense--or for all of them--the new SIG Sauer P226 USPSA pistol deserves strong consideration. It is a real multitasker.